Quality sleep is important for good health and we put a lot of research and energy into the purchase of our own mattresses, so why wouldn’t we do the same for our dogs? Below we’ve rounded up an assortment of beautiful, comfy dog beds your own fur babe will love lounging on. Casper has become known for making some of the most comfortable mattresses for humans, and now your pup can relax on that same pillow-soft, well-supported dream-of-a-mattress, too! 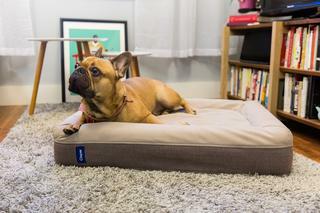 The Casper Dog Mattress was engineered by the same crew that makes mattresses for humans. 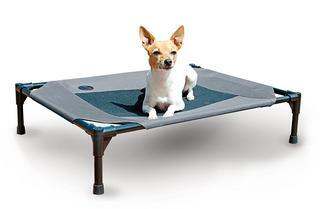 The dog bed is built to last while ensuring max comfort for your dog. You’ll find three size options with three different color choices. B & G Martin is an upscale indie pet products company named after founder Tamra Martin’s two adorable dogs, Butch and Gus. 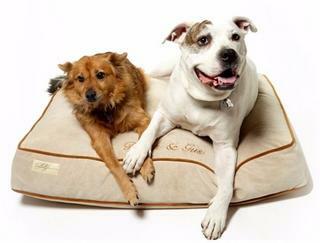 On their website, you’ll find an assortment of dog bed cushions that are eco-friendly and built to last. Customize your dog bed by choosing from three different looks — microsuede, faux leather, and designer — many color options, and three types of inserts: recycled green poly fiber, faux down, and foam topped with faux down. The cushions are excellent dog beds on their own, but you can add more support (and style!) via a wooden or metal wire base. 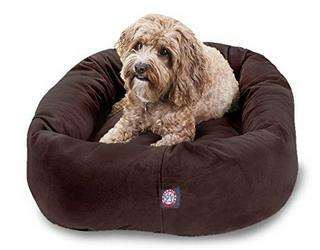 For an option that is more budget-friendly, check out Majestic Pet’s Suede Dog Bed. This bagel-style mattress starts at $34 for the 24-inch bed and tops out at $87 for the 52-inch bed which, according to reviews, is spacious enough for a 115-pound Mastiff. The base is made from waterproof 300/600 Denier and the bolster around the side gives pets a place to rest their head, which also provides spine support. Choose from seven different color options, including navy, chocolate, gray, rust, stone, sage, and black. For the pup that likes to burrow and be under covers, consider a cave dog bed. The sizes range from extra small to extra large and provide a dark and quiet sanctuary for serious sleepers. They are especially perfect for hairless breeds and those with a thin coat like Italian Greyhounds and Whippets. 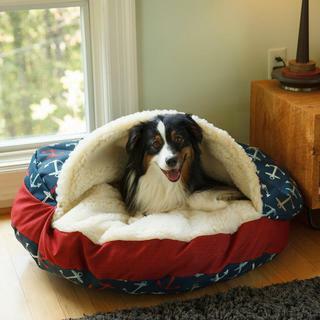 The Snoozer Pet Products Cave Dog Bed is constructed from high quality materials including Sherpa lining, mildew-resistant fabric, and fray-proof edges that make it ideal for indoor or outdoor usage. They are available in a handful of beautiful designs. K&H Pet Product’s Pet Cot is another budget-friendly option available on Amazon for around $30 for small, medium, and large sizes. It’s constructed from waterproof, 600 Denier fabric and features a breathable mesh center that will help keep your pooch cool. Because giant dog breeds may need more cushioning for their joints — and to improve the cot’s lifespan — we recommend this option for pets that are under 100 pounds. 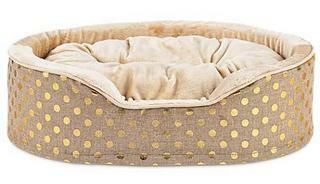 This orthopedic dog bed from Harmony has a classy look and provides comfort and support for your pooch. The bolster walls make it feel extra secure and cozy, plus they assist with spine support. Additionally, the cushion is made from orthopedic-grade foam to support the hips and joints while relieving pressure points.